If I had to name my top five entrees, meatloaf would be on that list. Maybe not No. 1, but it is definitely among my favorites. For years — after moving on my own 13 years ago — I rarely ate meatloaf unless someone made it for me, which wasn’t often. I wasn’t much of a cook back then, and I figured meatloaf was difficult to make and kind of messy. You have to mix the ingredients together with the ground beef using your hands. I discovered that cooking a meatloaf is simple and quick. Most recipes I found online don’t require a lot of ingredients and cook in less than four hours. I’ve tried a few recipes, but I have still not gotten used to the messy preparation of meatloaf. But for my love of the dish, I have soldiered on each time no matter how messy my hands get. For this month’s recipe, I’m attempting a recipe I have never tried before. I found the recipe on geniuskitchen.com and requires only five ingredients. Six, if you count the ketchup for garnish. 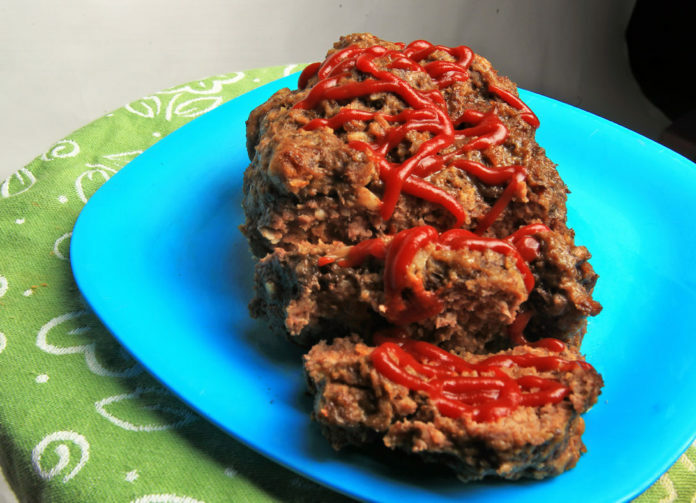 The recipe doesn’t call for ketchup but I always eat my meatloaf with ketchup. One of my co-workers prefers Miracle Whip. This recipe also allowed me to discover dry onion soup mix. I honestly have never heard of it before. I don’t know what world I have been living in. The meatloaf only takes 10 minutes to prepare and only three hours to cook in your slow cooker on high. If you have more time, you can cook on low for six hours. >> In large bowl, combine eggs, milk, bread crumbs and soup mix. >> Shape into a rectangle or oval. Make sure the meat loaf does not touch the sides of the crock pot. >> Cook on high for three hours or low for six.